The last few years have given way to a global trend, shifting towards healthier fast food options and, with an estimated 65,000 outlets globally, sushi is a leading contender. 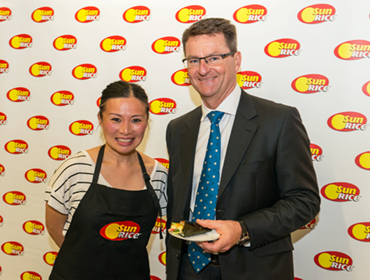 To showcase how NSW rice is featuring in the ‘sushi revolution’, on behalf of SunRice, Sauce’s talented event’s team organised a rather delicious event at NSW Parliament House in October that was hosted by the NSW Department of Primary Industries (DPI). Key sushi rice varieties being grown in NSW and sold by SunRice were put to the test at an exclusive cooking demonstration and taste testing by SunRice brand ambassador, TV cook and author, Poh Ling Yeow for over 50 politicians, including NSW Primary Industries Minister Niall Blair, and DPI and SunRice employees. All-in-all, it was a fantastic and tasty event that Sauce was proud to be a part of, showcasing locally-grown rice while supporting a global shift towards healthier lifestyle choices.